Details relating to the Portuguese Commemorative of 2017. The coin celebrates 150 years of public security in Portugal. In the inner circle there are stylized images of people and buildings . On the right, between two and three o’clock are the words DIRETTOS,LIBERADADES and GARATIAS (Rights, Freedom and Guaranties). At the top we see PSP followed by the insignia of the police. 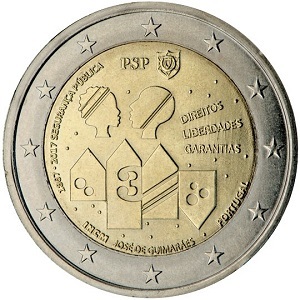 THE initials PSP stand for “Policia de Segurança Pública”(Police of Public Security). Around the edge of the inner circle are the following inscriptions. INCM is the mint mark and José Guimares is the coin designer. From Portuguese Commemorative 2017 to euro coin collector.